My sister recently made a request. 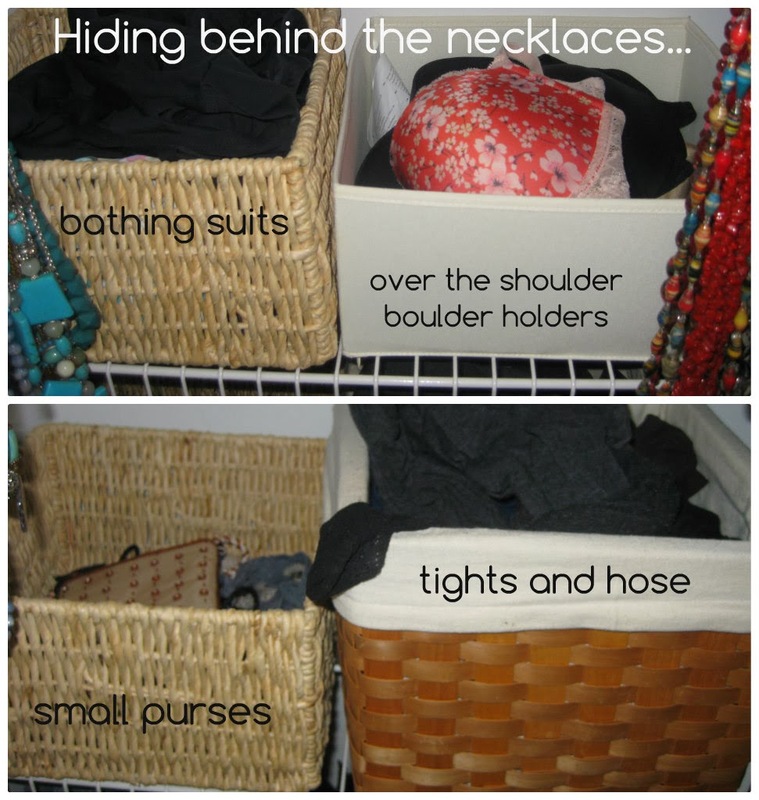 She asked: can you show how you organize your jewelry and closet? I revealed my closet once before during my first official closet edit but that post was more about the editing process than the closet itself. I like a good challenge so I ordered my sister over for some closet edit advice then let Closet take the spot light. 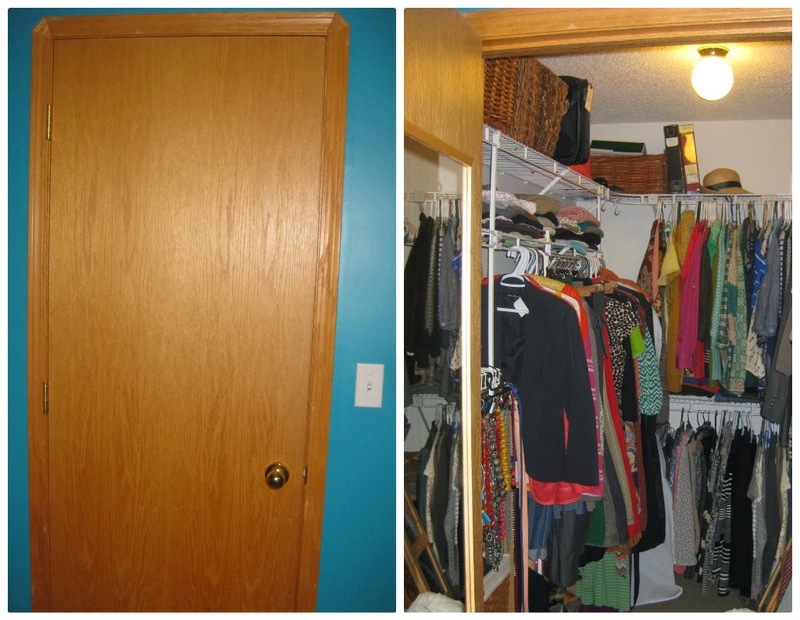 Would be more interesting if it led to Narnia, but I will take my ample closet as a close second! I know, I am very blessed to have a huge closet. I would work with a smaller space if I had to but since I don't, I have evolved my organization within this glorious reality. I do allot some space for Mr. Style on the right side, but I have taken over the left and the back. It wasn't always this full but thrifting has allowed me to indulge my style and fill my closet without stretching my budget. 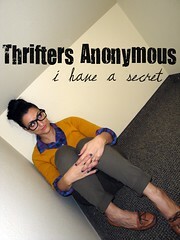 Basically, this closet was MADE for a girl who thrifts! What you're about to see followed an afternoon of difficult closet cuts. I followed the same process as my last closet edit but this time, I thought more about the "air time" that I would be able to give pieces; even if I still liked them, if I couldn't secure them a spot on the court, I let them go. Shall we start the tour?! First up, accessories! For as long as I can remember, I have used a plain bulletin board for my earrings. I use straight pins then hang 'em or stick 'em right in by the posts. I try to loosely group by colour but am not too particular. About that. 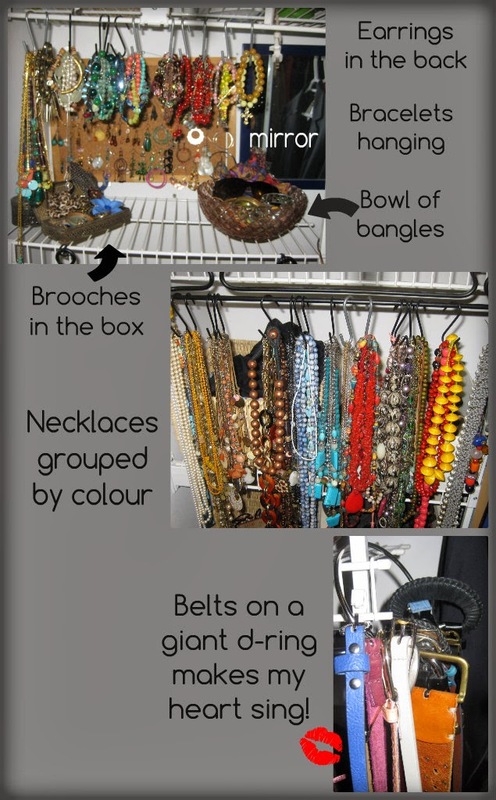 I use s-hooks on my closet rail to hang bracelets by colour. I used to have bracelets and bangles all in one big box but could never find what I wanted. I do have some necklaces up by the bracelets for the sole purpose of keeping them out of reach of little girls. For my necklaces, I attached an inexpensive Ikea rack to my closet bars using heavy duty zip ties then again used s-hooks to group my necklaces loosely by colour. In the past, I put some over the rack rather than using the s-hooks but found it cumbersome to have to undo the clasp! (man am I ever a diva) I only recently put my belts on a d-ring and I love it. It is so easy to get to what I want and they take up much less space. 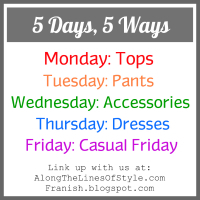 My organizational goal is to make it fast and easy to accessorize! Next up, the left side of my closet! This area has space for longer items. I stash a shoe rack under the dresses for off-season or seldom-worn shoes. I generally put dresses from lightest weight to heaviest weight or longest to the right! 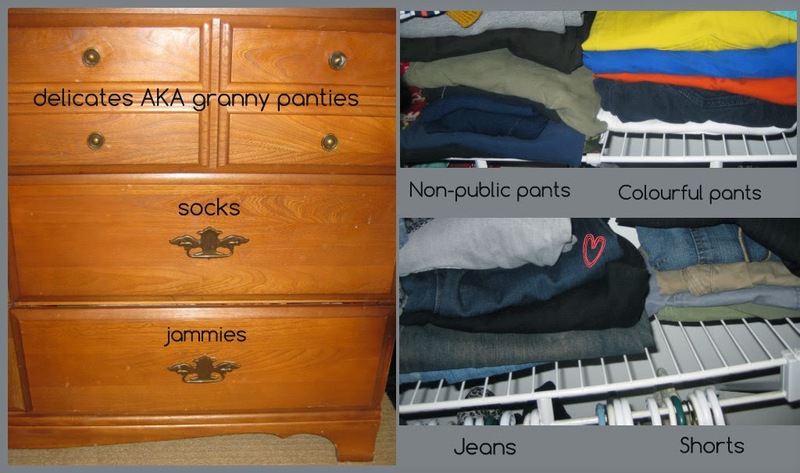 My pants are in no particular order; since I've ousted all capri pants, I don't need heavy duty organization here. I store other pants on the shelves under my hanging tops. I just have to part the tops and reach what I want; I think of Moses and the Red Sea every time. Here's the rest of my pants, seas parted. Though I don't change over my wardrobe seasonally, I do rotate my scarves. Don't question; it works for me and that's all that matters. Next up, the prime closet real estate, the Beverly Hills of my closet... the back racks! I don't keep outerwear in my closet except for a couple lightweight coats. 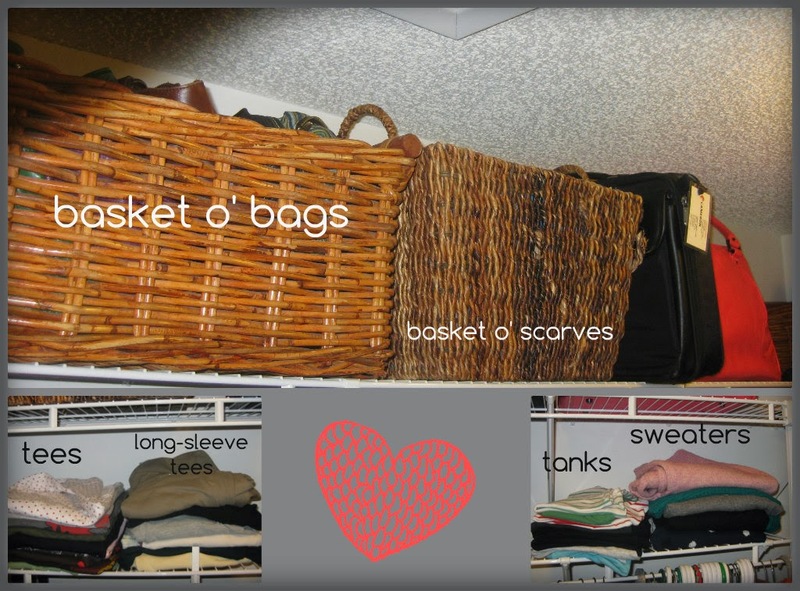 Remaining shoes, scarves and coats are split between our two entry closets. I converted one entry closet to be used specifically for shoes. Everyone gets his/her own hanging shoe holder and there is room underneath for the kids' boots and my growing collection of she-booties. I use the same Ikea rack as for my necklaces for scarves, where they hang out and greet me every morning! There you have it. That's all my clothes. Or should I say "all" my clothes?! I'm guessing that some people have more clothes, some have less than me. I say, it's not the volume that counts but the organization! Can you find what you're looking for? This isn't a U2 song! 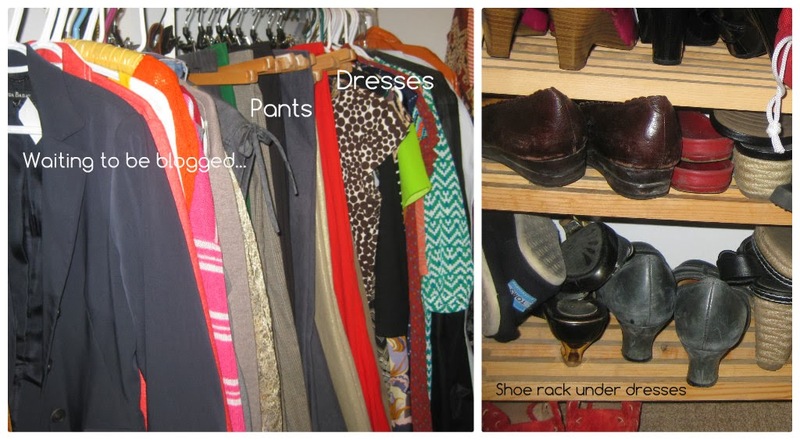 If you have only 5 minutes to get ready, every organizational detail helps! What about you? 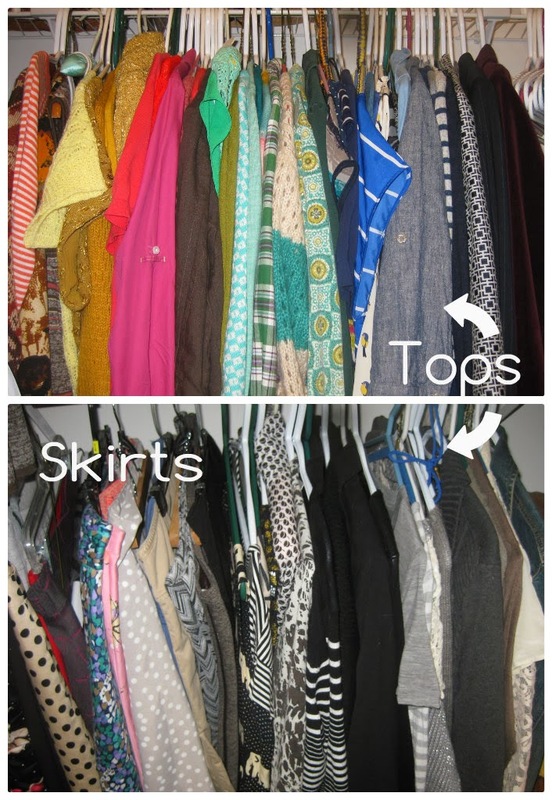 What are your favourite closet organization tips?! Awesome tour…thank you for sharing all the details and I am sure you will inspire us all to become more prepared for the fun of getting ready for the day!